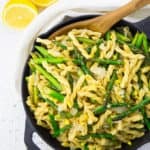 Lemon Asparagus Pasta – Ready in 20 Minutes! 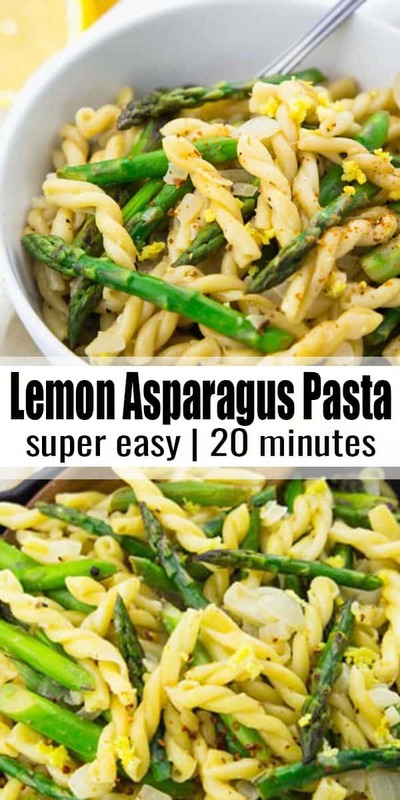 This lemon asparagus pasta is not only super delicious but also very easy to make. It’s basically a one pot recipe. And it’s just the perfect recipe to embrace spring! I don’t know about you, but I’m so ready for spring. I thought the weather was finally getting better, but then we got another huge snow storm here in Montreal. Yikes! Nothing I want in March! 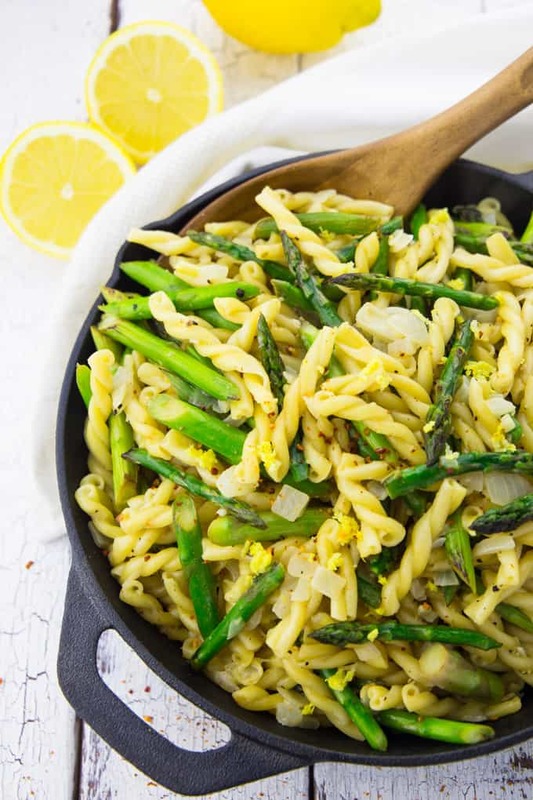 So at least I need to have some spring recipes on my plate and this easy vegan lemon asparagus pasta is one of my favorites! The recipe for this lemon asparagus pasta is basically a spin-off of my lemon spaghetti with spinach. We’ve had it so many times in the last few months, so I wanted to make an asparagus pasta with it. And I absolutely loved it! The ingredient list for this pasta is pretty short. No hard to find ingredients! 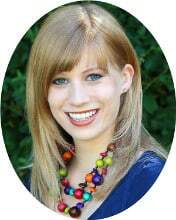 As always you can find the full ingredient list and the recipe instructions in a separate recipe box at the end of this post. kind of decadent, which makes it perfect for date night! As I’ve already said, this lemon asparagus pasta is a one pot pasta recipe. This means everything is cooked in one pot including the uncooked pasta. You only have to sauté the chopped onions and the garlic. I decided to pan-fry the green asparagus for this recipe. You can either do this in the same pot before cooking the pasta and set them aside if you want to make a real one pot recipe. If you don’t mind getting another pan dirty, you can also do this while the pasta is cooking. 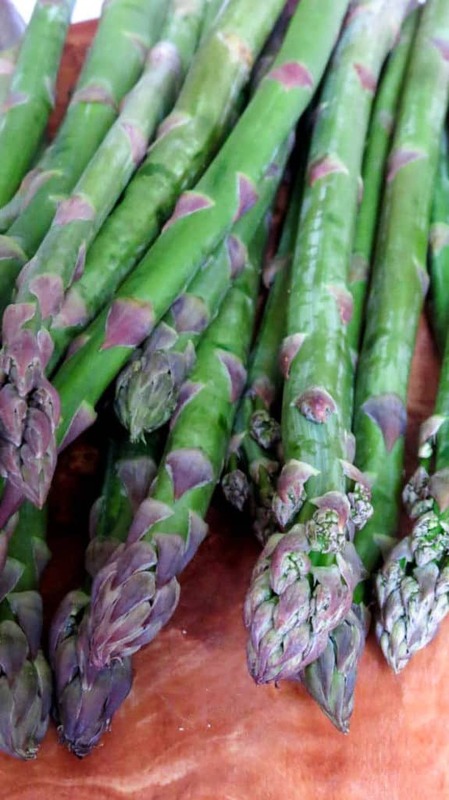 Just add some oil in the pot or a pan and cook the asparagus for about 5-8 minutes depending on how thick they are. I usually cut them into 2 inch pieces so they are easier to eat in the asparagus pasta. Make sure to cut off the woody ends of the asparagus. If you don’t know how to do this, check out this video on how to trim green asparagus. I like green asparagus pasta best with a creamy sauce. Can you buy vegan cream? And what is soy cream? Before I became vegan, I used to love asparagus with cream sauce. 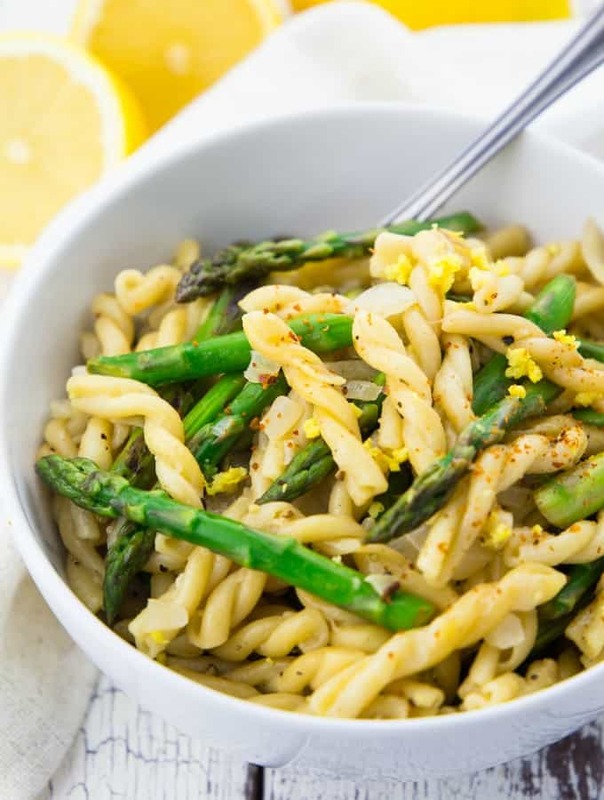 Using coconut milk for this vegan asparagus pasta with lemon is such a great and easy way to get a creamy sauce without using dairy. I also like using vegan soy cream or even oat cream when I can find it. Many supermarkets offer soy cream these days, for example those from alpro or Belsoy. They both make a great substitute for dairy cream in creamy sauces. They’re rich and smooth without using any dairy products. However, I’d say if you live in a rural area and have problems finding special vegan products, canned coconut milk is the easiest alternative to make vegan creamy sauces besides nut butters. You can find it in basically every supermarket. Make sure to use the full-fat version. I also decided to use canned coconut milk for my lemon asparagus pasta. I hope you like the recipe for this lemon asparagus pasta as much as we do around here! 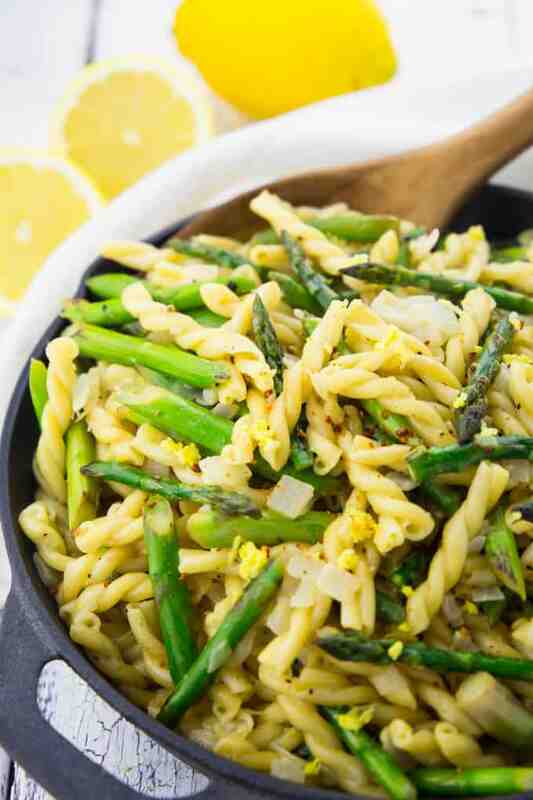 This lemon asparagus pasta is not only super delicious but also very easy to make. It's basically a one pot recipe. And it's just the perfect recipe to embrace spring! Cut off the woody ends of the green asparagus and cut it into 2 inch pieces. Pan-fry it. You can either do this in the same pot before cooking the pasta and set them aside if you want to make a real one pot recipe. Or if you don't mind getting another pan dirty, you can also do this while the pasta is cooking. Just add some oil in a non-sticky pot or a pan and cook the asparagus for about 5-8 minutes depending on how thick they are. Add the uncoooked pasta, the vegetable broth, the coconut milk, and the lemon juice. Cook for 15-18 minutes. Stir a couple of times while cooking. When the pasta is al dente, stir in the lemon zest and the cooked asparagus. Cook for 2 more minutes and season with salt, pepper, and red pepper flakes. Enjoy! So yummy! I used bow tie pasta since that’s what I had, and threw in a tomato to stretch it. Super-good! Thanks! This pasta is so creamy! It’s just perfect for spring and summer, super light. I will definitely make it again. Love this recipe! Using coconut milk was great! Super creamy and delicious! Making more tonight! This has became one of our go to favorites! We used gluten free pasta and our multipot. Super quick, healthy and yummy! Oh and the lunch leftovers make me happy! Wow, absolutely delicious. My coworkers & husband are both having a hard time stopping…like nothing we’ve tasted before. The coconut milk gives it almost a hint of sweetness & it’s creamy without being “gluey” at all. It’s a keeper! !